Palm Springs meets South Beach. All photos courtesy of The Hall South Beach. 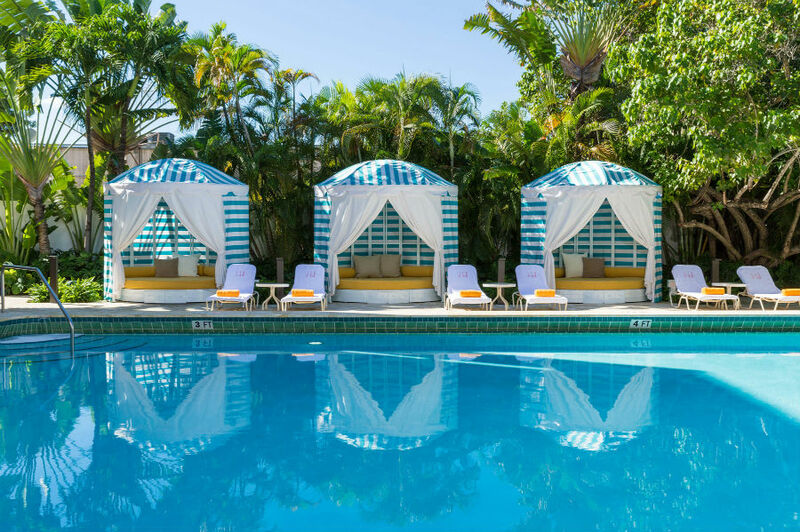 There are more hotels in South Beach than you can shake a bottle of sunscreen at, so how do you choose where to rest your suntanned head? 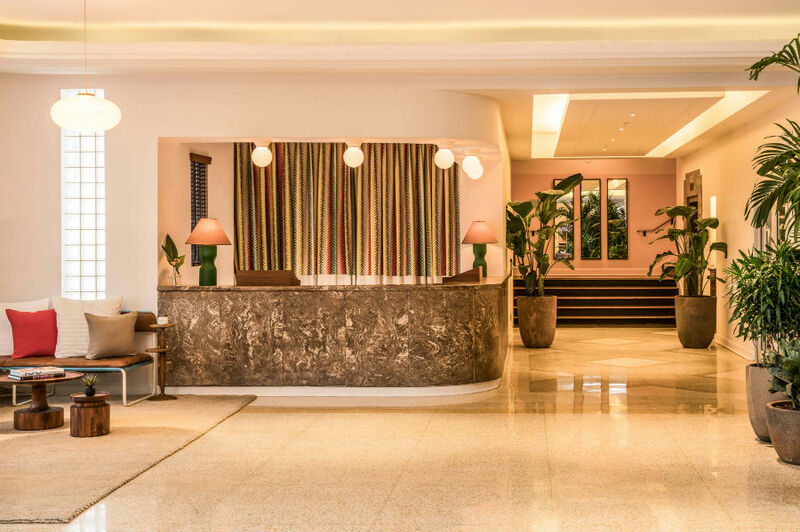 For travelers looking for a central location, party atmosphere, and occasional double digit price tag, The Hall pulls through. The cute Deco building on Collins Avenue has chill California decor vibes. It's a straight shot down 15th to the beach. And it's around the corner from the cute Latin spots of Espanola Way. Shield your eyes from neighboring Señor Frogs and look inward instead — there's an outdoor beer garden under a huge banyan tree, an enormous pool, and very Instagrammable striped cabanas. Vibe: Young and playful. 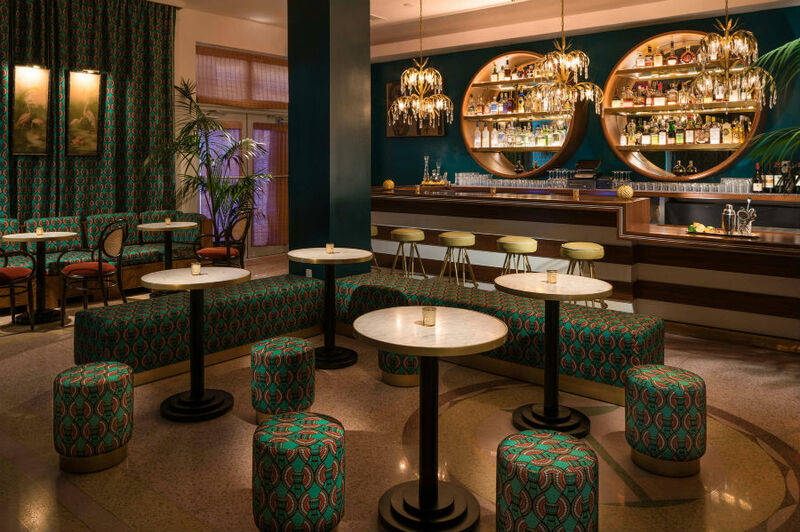 The Deco spot on the South Beach strip is cheap and cheerful and does the trick of ensuring that you feel like you are doing the vintage, palm-fringed Miami thing in style. It’s all fun and games (ping pong, shuffleboard, bocce) in the backyard lounge. And guests are a one-block walk to the ocean. Standout Detail: An enormous banyan tree with lanterns, under which people drink frosty beers and snack on not-so-swimsuit-friendly foods (like salty fries and hot pretzels the size of your head). 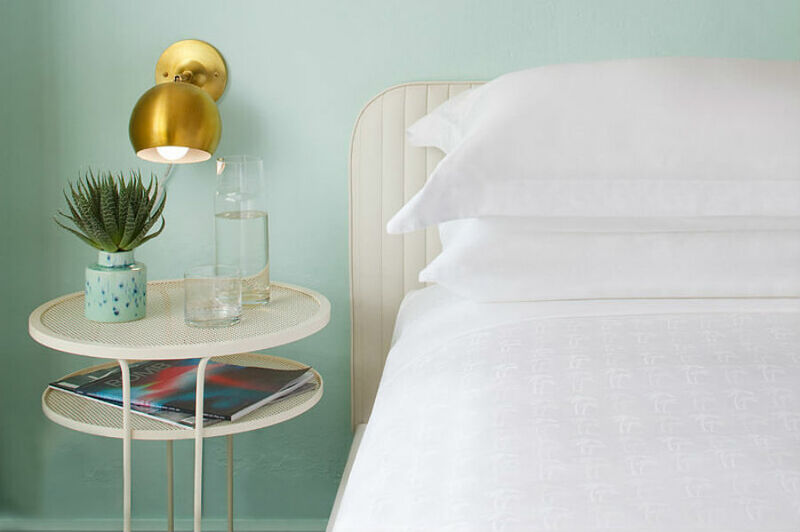 This Place Is Perfect For: Budget-seekers who want vintage details on the strip without the Delano prices; young people who welcome a Saturday pool party vibe. 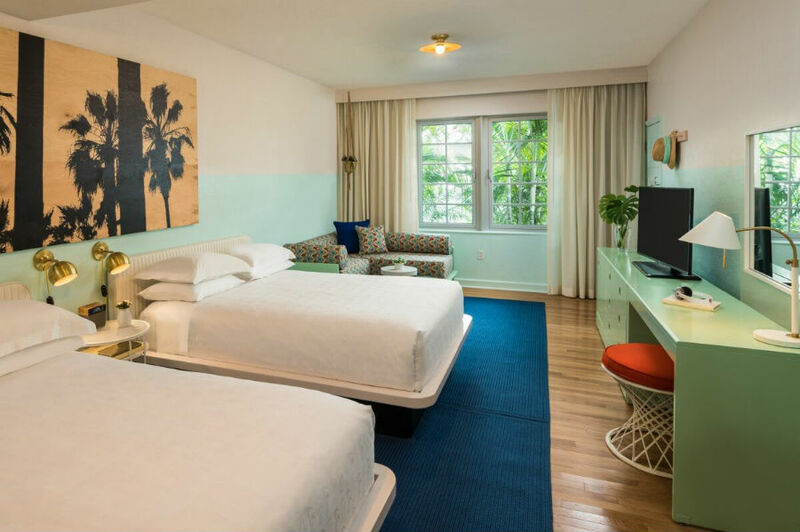 Rooms: There are 163 chill and tidy rooms with hardwood floors, palm tree paintings, and walls dip-dyed in Floridian pastels. There's also a large flatscreen TV, Jonathan Adler toiletries, and a mini fridge. On Site: Three bars and lounges, a casual restaurant, Olympic-size pool with private cabanas, free WiFi. With advance notice, pets are welcome at no charge. Guests have access to a section of the beach with lounge chairs and umbrellas. Food + Drink: Beachy favorites at Sunny’s, a casual eatery opened by Top Chef alum Spike Mendelsohn, plus plenty of places to perch with a cocktail, like the Afro-Latin bar inside or the 5,000-square-foot Campton Yard beer garden outside. Hit up the beach and its serpentine boardwalk for early morning walks, late-afternoon dips, and evening strolls. Walk up to the counter at the understated South Beach staple La Sandwicherie for French bread sammies and smoothies until 6 in the morning. 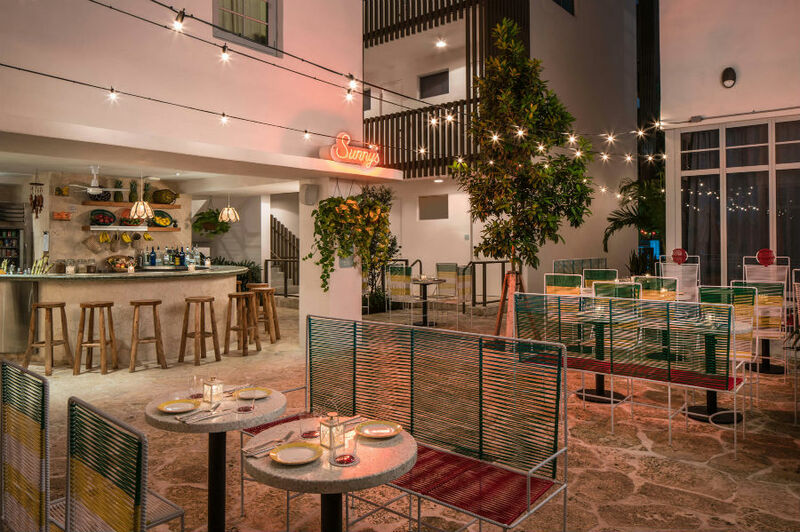 Around the block are the Latin-tinged bars and restaurants of Espanola Way, but even closer is Taquiza, a grab-and-go taco spot that makes their blue corn tortillas by hand.